How does brain development affect adolescent behaviour? 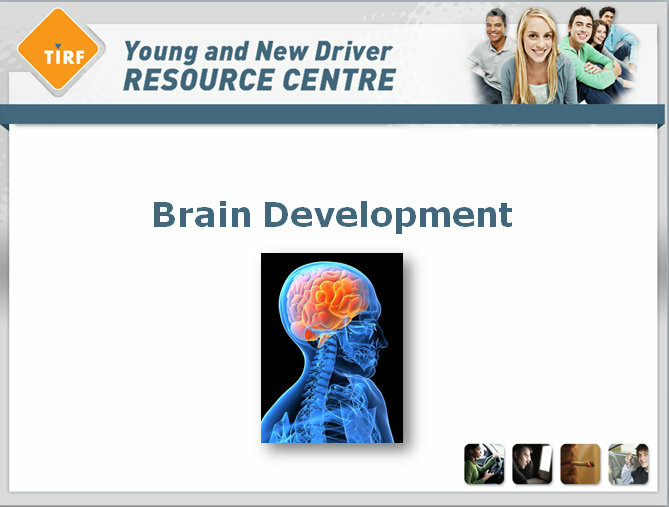 How does brain development affect adolescent driving? What limitations do young drivers have that older drivers do not? How do the limitations of young drivers affect their involvement in crashes? What are common types of crashes among young drivers? How does alcohol affect the brain development of teens? How do drugs affect the brain development of teens? What are common misconceptions about brain development? What can be done to help adolescents maximize brain development? How can parents foster open communication with their young driver? A child’s brain begins to develop in the womb and does not stop until the mid 20s. There are different stages of development that must occur before the brain is considered to be fully developed, or to have reached adult status. Because the frontal lobe is the last part of the brain to develop, adolescents will have more difficulty with mental tasks that involve thinking clearly, decision-making and impulse control. The impulsive part of the brain, on the other hand, is almost fully developed at adolescence. This leads to the impulsive, reckless behaviours that are common among adolescents, such as thrill seeking, irrational decisions and dangerous behaviours (which will be explained further in coming sections). Although the adolescent brain has the ability to make rational decisions, teens are more likely to act impulsively with gut instinct when they are put in stressful or emotional situations (peer pressure being a good example of this).4 The peak of puberty brings a desire for thrills, risks and stimulation.5 The combination of irrational decision-making and thrill-seeking can result in adolescents who can be aggressive, emotionally volatile and more likely to focus on and overestimate short term pay offs, as well as underestimate long term consequences.6 These tendencies may influence adolescents to participate in risky behaviours such as drinking and driving or experimenting with drugs. The frontal lobe is also responsible for initiating attention and stopping attention.7 Planning, reasoning, integration of information and impulse control,8 all skills that are needed to become a safe driver, are underdeveloped until a person reaches an age of mid-20s. This means that once adolescents get behind the wheel, they have difficulty keeping their attention on the task of driving, understanding all the stimuli in their surroundings and making quick decisions about how to react to hazardous environmental changes. They may also have a desire to speed, drive aggressively (run red lights, cut other drivers off) or to get behind the wheel when they are intoxicated. This also puts them at higher risk of distraction (by passengers, road signs, cell phones), increases their crash risk if there is an unexpected change in the driving environment, and encourages them to drive drunk or high. The limitations associated with young drivers can be understood as a result of hazard perception studies. Adolescents do not have much difficulty acquiring basic car handling skills when learning to drive (such as steering, braking) but the higher order tasks of driving which involve mental and perceptual skills are much harder to come by due to the underdeveloped frontal lobe. Thus, adolescents’ abilities to perceive hazards, visually search the road, and pay close attention to the entire environment are less developed than older drivers. Studies comparing hazard detection and hazard response of young drivers with experienced drivers show that adolescents detect fewer hazards than more experienced drivers and react more slowly to these hazards. Major sources of death and disability of adolescents are related to difficulties in the control of behaviour and emotion. The top three causes of death for adolescents are accidents (mostly road crashes), suicide and homicide.12 The increased likelihood to drive recklessly, whether speeding, being distracted, or impaired, and limitations such as inability to perceive hazards, contribute to adolescents having a disproportionate crash rate among all licensed drivers. In other words, young drivers are more likely to be involved in crashes than older drivers. Motor vehicle collisions are the leading cause of death among those aged 15-24, and collisions account for one-third of all deaths for this age group. Collisions also account for one-third of all traumatic injuries of this age group. The motor vehicle death rate among young people is double those of other age groups. One-quarter of road deaths in 2008 involved drivers aged 15-24, although this age group only accounted for 13% of the licensed driving population.13 This is illustrative of the magnitude of road deaths among youth, which can be explained by their different stages of brain development and impulsive behaviour. A study conducted in Florida investigated the contributing factors associated with young at-fault drivers in fatal traffic crashes. The most common road crashes involving young drivers were single vehicle, run off the road crashes. They were also overrepresented in at-fault forward impacts with control loss, meaning they were disproportionately involved in crashes in which a head on collision with an oncoming vehicle occurred due to the young driver losing control of the vehicle. This generally involved speeding or reported inattention, inability to use sound judgment and difficulty making quick decisions.14 All of these characteristics are representative of the nature of the adolescent brain. Speeding is due to the risk-seeking desire and the underdeveloped frontal lobe contributes to the lack of attention or improper decisions that result in a crash. Getting high impairs judgment which leads to risky behaviours. Judgment skills in adolescents are already weak, meaning cannabis leads to an even greater decrease in the ability of teens to rationalize and make good decisions. In other words, teens who get high are more likely to behave dangerously (such as getting in a car with an impaired driver).23 Cannabis also decreases concentration and the ability to retain information.24 This is problematic because adolescence is a time where the brain absorbs important information (lessons at school, learning how to drive) that is needed for the healthy shaping of the brain. If this is compromised, adolescents are likely to face difficulties in their future. Until recently (the past decade), it was generally believed the brain was finished developing by age five. Parents were told to focus on stimulating their child in the first three years of their life in order to facilitate productive brain development. After this, it was believed the brain was ‘set’ and could no longer change or develop. Thus, parents no longer sustained efforts to stimulate the brain as they had in the earlier years. Now it is known that a child’s brain needs stimulation to promote development from age three to 16 and that adolescence is a crucial time to shape the mental path of a child. Recent discoveries have taught scientists, researchers and parents that it is not fair to expect youth to think and act like adults. Characteristically the ages 13-18 are seen as years during which youth become independent and start developing their own lives without the help of adults. Although this is still true, and fostering independence is important at this stage, parents still need to take an active role in guiding and influencing the decisions of the impulsive adolescent.25 It is important that adults acknowledge that, although adolescents can rationalize almost as well as adults in calm situations, it is stress that impairs the decision-making skills of teens in more emotionally charged situations,26 creating the need for parents to step in with their perspectives when possible. Fostering an open and supportive relationship with a new young driver can encourage young drivers to talk to parents or adults before making decisions or after a bad decision has been made. For instance, adolescents may drive to a party with no intention of drinking, but end up drinking alcohol. They may judge the negative consequences of driving themselves home as much less ‘scary’ than the consequences of calling their parents and admitting they have been drinking. Parents, on the other hand, would much rather receive a phone call in the middle of the night from their teen asking for a ride than a knock at the door from a police officer coming from a fatal collision. It is important that parents communicate these facts and let teens know during these times that they made the right choice to call. Gary Direnfeld, a social worker who specializes in family issues, developed the ‘I Promise Program – Teen Safe Driving Initiative’ to help develop teen-parent communication. The program is intended to initiate discussion between parents/adults and their teenagers about road safety issues that may otherwise be missed or overlooked, compared to discussing the matters on their own. The initiative is based on The Parent Youth Safe Driving Contract which is a nine-page document developed with input from police, driving instructors, insurance executives, stakeholders in traffic safety, parents, and youths. The contract covers risk issues, expectations and responsibilities for the safe use of the vehicle being driven, and instructions on what to do in case of collision as recommended by police and driving instructors. The contract can be used as a starting off point for parent/teen discussion which can then lead to a supportive honest relationship. Andreasson, S., Engstrom, A., Allebeck, P., Rydberg, U. (1987). Cannabis and Schizophrenia: A Longitudinal Study of Swedish Conscripts. The Lancet. 330(8574), 1481-1486. Alam, B.M., Spainhour, L.K. (2009). Contributing Factors for Young at Fault Drivers in Fatal Traffic Crashes in Florida. Journal of Transportation Safety and Security. 1, 152-168. Borowsky, A., Shinar, D., Oron-Gilad, T. (2010). Age, skill, and hazard perception in driving. Accident Analysis and Prevention. 4, 1240-1249. Dahl, R.E., Spear, L.P. (2004). Adolescent Brain Development: vulnerabilities and opportunities. Annals of the New York Academy of Science. 1021, 1-22. Department of Health and Human Services (DHHS). (2002). 2001 National Household Survey on Drug Abuse. Substance Abuse and Mental Health Services Administration. Office of Applied Studies. Emery, P.C., Mayhew, D.R., Simpson, H.M. (2008). Youth and Road Crashes: Magnitude, Characteristics and Trends. The Traffic Injury Research Foundation. Ottawa, Canada. Giedd, J.N. (2004). Structural Magnetic Resonance Imaging of Adolescent Brain. Annals of the New York Academy of Science. 1021, 77-85. Giedd, J.N. (2012). Inside the teenage brain: Interview, Jay Giedd. PBS, Frontline. Retrieved from: http://www.pbs.org /wgbh/pages/ frontline/shows/t eenbrain/interviews/ giedd.html. Grant, B.F., Dawson, D.A. (1997). Age at onset of alcohol use and its association with DSM-IV alcohol abuse and dependence: Results from the National Longitudinal Alcohol Epidemiologic Survey. Journal of Substance Abuse. 9:103–110. Greenblatt, J. (1998). Adolescent self-reported behaviors and their association with marijuana use. National Household Survey on Drug Abuse, 1994-1996.The Substance Abuse Mental Health Service Administration. Oude Egberink, H.O., Lourens, P.F., Van Der Molen, H.H. (1986). Driving strategies among younger and older drivers when encountering children. Accident Analysis and Prevention. 18(4), 315-324. Patton, G.C., McMorris, B.J., Toumbourou, J.W., Hemphill, S.A., Donath, S. & Catalano, R.F. (2004). Puberty and the onset of substance use and abuse. Pediatrics, 114(3), 300–306. Robertson, R.D., Marcoux, K.D., Holmes, E.A., Vanlaar, W.G.M. (2011). State of Knowledge: Female Drunk Drivers - Executive Summary. The Traffic Injury Research Foundation. Ottawa, Canada. Shinar, D. (2006). Drug Effects and Their Significance for Traffic Safety. Drugs and Traffic: A Symposium. June 2005. Transportation Research Circular. Woods Hole, United States. Winters, K.C. (2008). Adolescent Brain Development and Drug Abuse. Adolescent Brain Booklet. Mentor Foundation. Retrieved from: http://www.mentorfoundation.org/brain.php ?nav=4-160.